If a Popover Married a Donut . . .
it emanates an almost holy light. oh wait, that's just the oven bulb.
. . . their baby might taste like this. Or look like this. People, it’s time to jump ship on making pancakes. I mean, really. Mixing, sifting, there might be baking powder or was that soda, tempering butter into eggs, or was that vice versa. Keeping wet and dry separate? 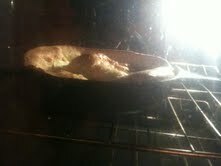 Versus the Dutch Baby, which has SO MUCH going for it. Basically it’s an oven-baked buttery eggy puff pancake that is somehow redolent of a donut in yorkshire pudding format. I tried to fit more adjectives into that sentence and it just doesn’t work: you need to taste it. It takes a bit of time in the oven, but the prep is lickity split —perhaps one minute of prep — and while it cooks you can either lay on the couch painting your toenails, or you can wipe day-old hummus out of your child’s neckfolds, depending on how you like to spend your free time. I posted the other day about my own kid kissing me on the mouth, and chances are good that all this love is due to the fact that on 2 separate days we slept late and then got up and ate Dutch Babies rather than oatmeal. Anyhow Sugarpea points out that B & B’s make Dutch Babies because they are sure-fire: I think they make them because they are EASY. I’ll give you the broad strokes below but you might want to save her recipe in your bookmarks since her timing is a bit different, plus she believes in measuring the vanilla. Serves me and my husband or me and my baby. this baby is faking nonchalance, but he did act impressed. i swear. Salt if you are using unsalted butter. maybe 18 minutes, reduce heat to 350, then cook for about 8 more minutes. Remove, gaze with wonder upon your delightful puffy and beguiling breakfast, saying “Whoa” a bunch of times if you are us, dust with confectioner sugar if you feel like it, and serve however you like. We served with sliced strawberries but try berries, apples, chocolate, nutella, lemon juice, bananas, maple syrup. Go forth and go nuts! Yum! I am going to make this soon. Heck, I might even get out of bed and make it now. I’ve seen the Dutch Baby on the menu at Original Pancake House and been too “health-conscious-in-public” to order one. Thanks to you, I will be making this tomorrow. Love it! love these! I grew up eating this, but we called it german pancake. Thanks for reminding me about them. Delicious! We love a Dutch baby now and then. Mom and I used a sleepover guest (child) as an excuse to make one, and then we ate as much as we could of it before the kids could ask for seconds. And then … we ate what the kids left on their plates. 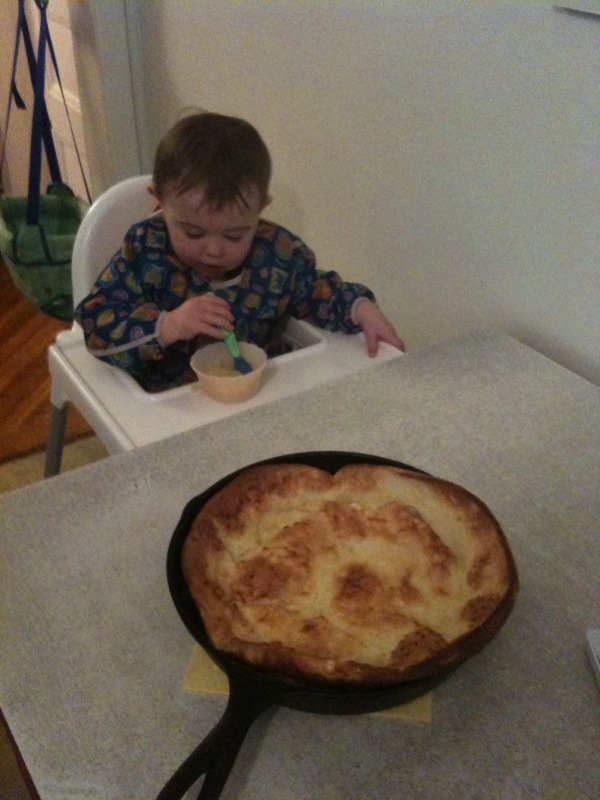 Because, leaving Dutch baby on your plate uneaten is wrong. i think you need to make another one (preferably on a weekend when more people are around in your household) so that you can take a picture and post that. Fort Defiance has a Dutch Baby pancake on their menu that comes with apples or pears sometimes and is served in an individual cast iron pan. i just wish they would get rid of the ‘pancake’ in the name. We made this for breakfast today! So delicious and easy. H called it a “butchered baby” which was pretty accurate, esp. at the end there. Oooh, I want to eat that!